Silicone jewellery is amazingly light and soft – and also allergy-friendly. Lightness of the material allows for showy designs and a large size. Coruu silicone jewellery is designed and manufactured in Finland. The lightness of silicone jewellery must be experienced first-hand – once you’ve tried it, no other jewellery will ever feel the same again! The Coruu silicone jewellery is made of high-quality, one-millimetre matte-coated silicone. Silicone is wonderfully soft and safe as a material, and you can use it in everyday life, at parties, when swimming or doing sports - wherever and whenever you like! The silicone articles do not contain any allergenic materials. Logo´s plate is acrylic. Logo´s fastening ring is made of steel. The parts of the necklace do not contain any nickel. At the back of the necklace there is a fastening system that allows you to set two different lengths for it. The necklace and bracelet come with small logo plates that are attached with a small shackle made of stainless steel. 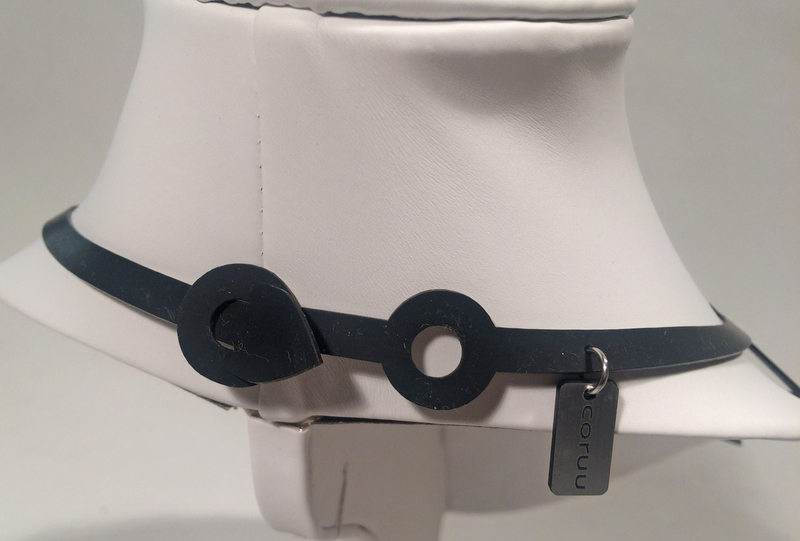 The bracelet has a fastening mechanism that you can use to adjust the length to your liking.